This pumpkin pie combines a creamy pumpkin filling with the brightness of fresh ginger and lemon zest and the full flavor of maple syrup. A lighter maple syrup grade will be subtler. I like the darker, robust syrups, but the choice is yours (read about maple syrup grades). The cutout leaves are optional. See Tips below. For the Filling: Position rack in center of oven. Preheat oven to 350°F. Spray a 9-inch deep-dish pie plate with pan coating. Roll out dough on floured surface to 12-inch round. Transfer to pie dish. Fold edge under, crimp decoratively. Place in refrigerator while you make filling. Whisk pumpkin, brown sugar and maple syrup in medium bowl to blend. Whisk in eggs one at a time until well blended. Whisk in cream, lemon zest, cinnamon, ginger and salt. Pour filling into crust and bake until filling is set, about 60 minutes. The edges will be firmer and the center might have a slight joggle. That’s okay, as it will firm up upon cooling. Cool pie completely on rack before serving. Can be made 1 day ahead; store at room temperature lightly covered with foil. Read the labels and make sure to buy 100% pure pumpkin and not pumpkin pie filling, which contains sugar and spices. Note that you do need a deep-dish pie plate for this recipe. There is too much filling to fit in a standard 9-inch Pyrex plate. If you should end up with too much filling, simply fill pie as much as you can, then bake any extra filling in ramekins in a water bath like pumpkin custard. 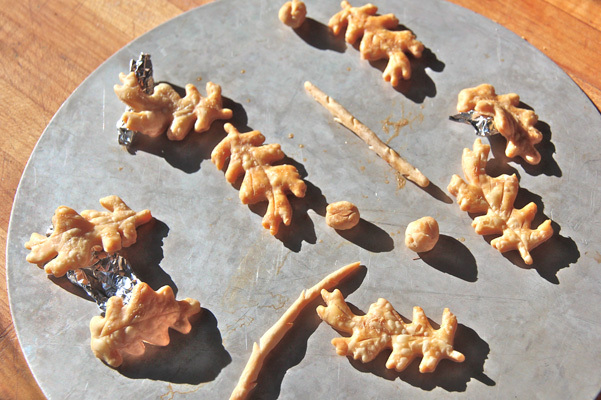 Any extra pastry scraps can be cut into decorative shapes, such as leaves, and baked on a separate cookie sheet. Just bake until light golden brown (check at about 10 minutes for small pieces). You can see how I have propped up some of the leaves with crumpled pieces of aluminum foil to create a 3D effect. 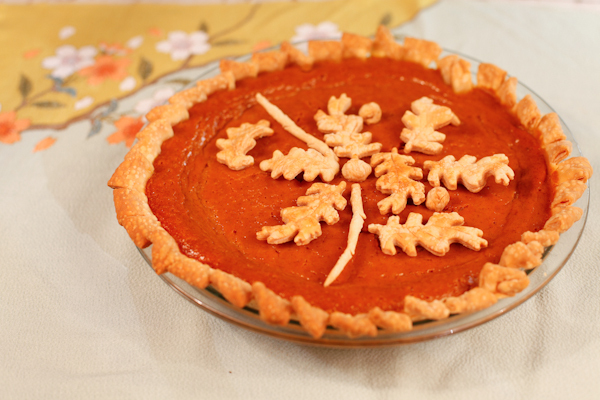 The shapes can be placed on the cooled pie right before serving. I used cookie cutters and also hand-rolled “twigs” and “berries”.